I'm planning an application which relay RTSP streams from Cameras to multiple clients. The figure below is informal data flow diagram about the application. outgoing streams starts with on client's demand. 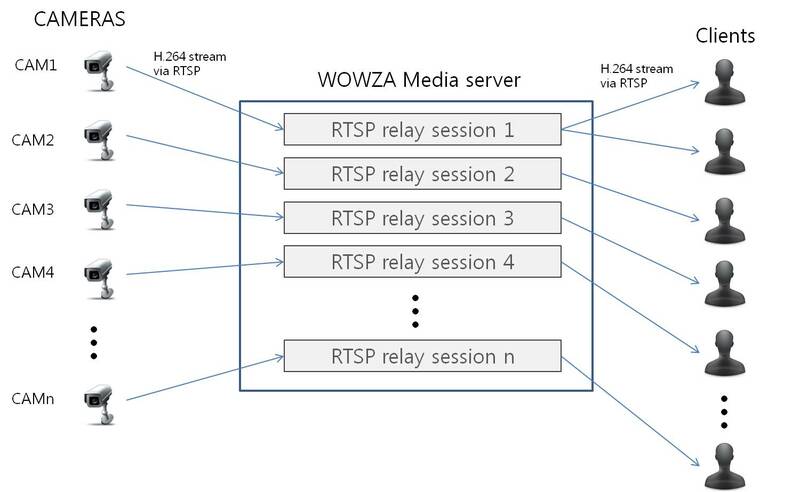 Can WOWZA media server works like that? I have more question about capacity. 1. How many streams can recieve at 1 machine. 2. How many outgoing stream can create per 1 RTSP input stream session. Can anyone replay this thread to help me? Incoming streams are limited by CPU and Memory. Some Wowza users get over 100 incoming streams, but on very robust server that is well tuned. Outgoing stream are usually limited by bandwidth, network throughput. You should get about 800MBS per 1gbs nic, which would be 800 1mbs streams.